His name says it all. 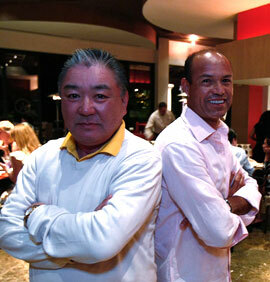 Masayuki Nickura is creating a high-end Japanese culinary concept together with Angel Carbajal. The resulting menu will be offered at Nicksan, which opened its first restaurant in Los Cabos eleven years ago. Today, this chef who has delighted Hollywood stars is in our destination participating at the International Gourmet Festival taking place in Riviera Nayarit and Puerto Vallarta. Nickura is working closely together with the host chef Alejandro Pelayo, a proud native of Nayarit. Both chefs can be found at Nicksan, located in the gourmet plaza of Marival Residences. Masayuki Nickura is a creative, reserved and talented chef. With a professional career that spans for over 30 years, he has delighted the palates of the most demanding customers, including a number of Hollywood celebrities in Los Angeles, California, since 1985. Thierry Blouet, Heinz Reize and Roland Menetrey, founders of the Festival and icons of the local culinary scene stated that this year the Festival will incorporate new additions to the original concept, like a chef's table, Tequila samplings, cheese and wine tastings, and kitchen classes with simultaneous translation. Twelve Riviera Nayarit restaurants will participate at the Festival with a wide variety of influences and tendencies. Along with Nicksan, Café des Artistes del Mar at Hotel des Artistes, Frascatti, Omaggio at Marival Residences, Sea Breeze at St. Regis, Lucca at Grand Velas, Tramonto at Grand Mayan, La Casona at Villa La Estancia, Porto Fino at Dreams Villa Magna, El Delfín at Garza Canela Hotel in San Blas, Emiliano Restaurant in Tepic and Ketsi at Four Seasons will be present at the event.